Being able to bend light backwards would be extremely useful for all kinds of optics from telecommunications to chipmaking. This kind of bending -- negative refraction -- is controversial in physics circles and has only been demonstrated using carefully designed artificial materials containing metal loops. It turns out that a common natural crystal has harbored this capability all along. Apply electricity to a microscopic tube of water and the water flows. Turn the equation around and force water through the tube instead, and electricity flows. Put enough of the tiny tubes together -- several million or so -- and you get useful amounts of power, and a new, clean source of energy. Studying how people make decisions in financial markets is tricky because of the large numbers of players involved. A Web-based game that pits one person at a time against 94 virtual players brings the picture into focus. The results show that people are able to stay ahead of the game even when things get too complicated. 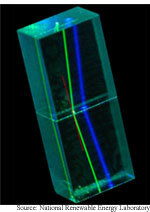 Making fiber-optic lines that are hollow is one step toward more efficient telecommunications. Making lines that are full of holes goes further. Lots of regularly spaced holes bend light, which keeps it on the straight and narrow. Stored data continues to swell... Electrons spin magnetic fields... Textbook queries video... Rig fires more photon pairs... Process prints silicon circuits... Paired molecules store data.